Rising. A Requiem For Father Murphy heralds the final curtain call for experimental music duo Father Murphy. Right there with them for a large portion of that journey has been Portland-based, Italian artist (and multiple DN alum) Luca Dipierro, in a circular creative relationship which has seen Luca provide visuals for Father Murphy’s songs and the Italian two-some score Luca’s film work. Today, Luca and Father Murphy’s Chiara Lee & Freddie Murphy join us on the Directors Notes podcast to look back at the origins of their fruitful collaboration and reveal details of their largest project to date, a feature animation film called The Cadence. Animating a medley of pieces from the album Rising. A Requiem For Father Murphy, this is the fifth and final chapter in a pentalogy of films created by Artist Luca Dipierro for Italian duo Father Murphy. When you are in a corner you have to come up with something, I think creativity works that way. 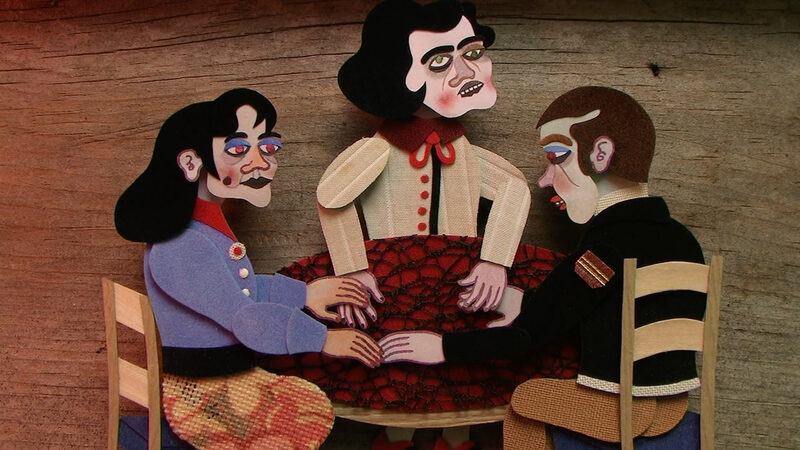 And here’s the trailer for The Cadence, the forthcoming feature animation entirely filmed in stop motion with marionettes made of paper and old book cloth.